Tree risk assessment can be a heavy burden to carry as life is always on the line. This includes the lives of your family, and the lives of your trees. I take this responsibility with great care and solemnity, and hope to impart to you the basics of risk recognition in the field of arboriculture. This brief article is the first in a four part-series, and only gives you a starting point in understanding a trees reaction to environmental stresses and the “body language” those stresses leave behind. This being said, I would always recommend seeking the guidance from a certified tree risk assessor if you have any concerns with your trees. Modern tree risk assessment methods weigh the risk factors in three categories; the probability of failure, the size of the part that is likely to fail, and the target that would most likely be struck in the case of failure. These three factors are quantified into a numerical rating that equals the risk rating of your tree. Using this method we are able to prioritize the work that is needed in your yard, and are able to make a long term plan that works for your budget. Before moving into the “body language” of tree stress, I will explain the way trees deal with decay as explained by Dr. Alex Shigo. When Trees are wounded, they are unable to heal themselves by replacing or repairing damaged cells like you and I. Instead, they work to contain the wounded area and grow new tissue around the wound. This damage can be caused by physical injury, physiological stress (such as droughts), flood, excessive heating or cooling, nutrient deficiency (or excess), or decay resulting from invasion by fungal and bacterial pathogens/insects. Trees will react to injury in an ordered and predictable way. They will block or slow the spread of decay through setting up a series of four walls that are made by modifying wood cells, chemically or physiologically. Wall 1 works to contain the spread of decay throughout the tree trunk, branch or root. This is the weakest of the four walls. 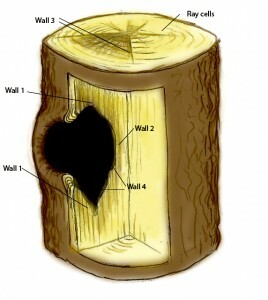 Wall 2 works to stop the spread of decay moving inward toward the center of the tree, by closing off the latewood cells (dark portion of the growth ring). This is considered the second-weakest wall. Wall 3 works to stop the spread of decay from spreading from the point of injury around the trunk, by using the ray cells on either side of the injury. This is a discontinuous wall that is very strong. The first three walls are comprised of normal tissues – These walls change their normal processes to that of a defensive function after the tree has been injured. This change involves the creation of decay-resistant compounds that work to slow or stop the effects caused by the injury. Wall 4 is the wall that forms between the injured tissue, and new growth that develops after the injury. This wall is also called the Barrier Zone, because it serves to prevent decay from moving outwards into the new growth. Wall 4 physically separates the old wood from the new wood, making a very strong defense against decay. This portion is structurally weak however, on account of the new ray cells being disconnected from the old ray cells. This is often were cracks will form around, or up-and-down the tree. The trees ability to use the C.O.D.I.T. walls effectively is affected by genetics, health, vigor, and the growing environment. Please keep in mind that there are still pathogens that are very aggressive, and may continue to breach all the protective walls. It is very important to understanding the nature of the injury, the organisms that has moved in to infect the wound, and the tree that has been injured. Next week we will be discussing the types of decay that is found in trees.